A1000 Fuel Pump– This is the pump that started it all. Durable, reliable, good looking and it supports high horsepower. Perfect for the daily driver that doesnʼt run like a daily driver, which mean Street Class in Time Attack! I chose Aeromotive being that they are the leader in the industry as well as a name that I can trust, not having to worry about a fuel pump going bad makes life a little easier. A1000 Injected Bypass Regulator- How many times have you popped the hood of a high performance Subaru to find an Aeromotive Regulator. I can easily say that they are used in so many applications that it is hard to believe any other that has been tested and proven quite like it. The Performance EFI regulator designed for medium to high horsepower applications. This regulators features Aeromotive’s high-flow design, superb pressure control and legendary durability. On the street and at the track, this pressure regulator has logged more miles, laps and passes than any other performance EFI regulator in the world! After upgrading your fuel pump, and fuel injectors, you will start to see the limitations of the factory fuel pressure regulator. The Aeromotive Adjustable Fuel Pressure regulator will allow you set your base fuel pressure from 40 to 75 PSI. This regulator is Alcohol compatible. It is a 1:1 Rising Rate Fuel pressure regulator when referencing off boost pressure. This means that for every 10psi your car runs, it will increase your fuel pressure equally. 10 Micron Fuel Filter- An inexpensive insurance policy to protect your investment (ROB). Proper filtration is key to fuel system performance. Engineered filter solutions are required to achieve protection with minimum restriction. For 200 – 3,000 plus HP applications, the filter assemblies offer unmatched flow, ease of installation and maintenance, along with the impeccable machining and finish you’ve come to expect from all Aeromotive components. All filter assemblies feature an O-ring for positive sealing in high pressure applications. Fuel Rails- Aeromotive High Flow, Billet Fuel Rails combine 3,000 HP flow capabilities with “bolt-on” ease of installation. They are CNC-machined, billet aluminum construction for unequaled fit and finish. Steel mounting brackets, combining a solid, durable mounting platform with correct fit and “bolt-on” ease of installation. Not to mention the Red anodized finish that looks great in the engine bay! 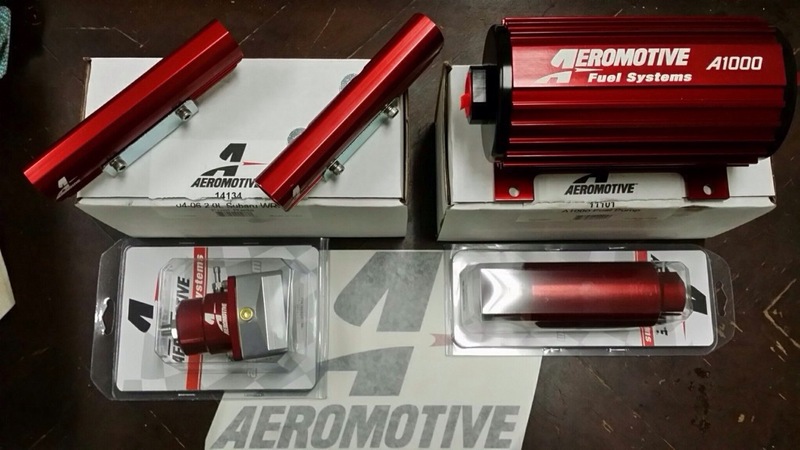 This entry was posted in Product Reviews and tagged a1000, aeromotive, build, e85, filter, fuel, motor, pump, rails, regulator, sti, subaru, system. Bookmark the permalink.